Despite being relatively harmless from a medical point of view, skin tags can have a significant impact on a person’s self esteem and general happiness. The good news is, there are a host of effective home remedies that can be used to remove skin tags. With this in mind, let’s find out how to get rid of skin tags quickly and cheaply, in the privacy of your own home. 13 What Is A Skin Tag (Acrochordon) Anyway? 14 What Causes Skin Tags? Whilst creating this post, I decided to have a look and see if there are any skin tag removal products on the market. There are a few creams and potions, but the TagBand skin tag removal device seems to be the most popular option. I have zero experience of the TagBand device, but a quick look on Amazon shows the device comes in two sizes – one for small to medium skin tags, and another for medium to large skin tags. Combined, these devices currently have around 1100 reviews on Amazon, with an average ranking of 4/5. A 4/5 ranking from 1100 reviewers would suggest that the TagBand Devices are definitely worthy of your consideration. The TagBand basically comprises a TagBand cone, 10 x TagBand bands, and a TagBand remover tool, for pushing off the bands onto the skin tag. Simply slide one of the bands from the narrow end of the cone, to the wider/larger end of the cone. Now place the larger end of the TagBand cone over the skin tag. Apply gentle pressure so the cone is pressed over the skin tag, and against the surrounding skin. Finally, use the supplied tool to push the rubber band off. The band will now tighten around the base of the skin tag, cutting off the blood supply. This will cause the skin tag to die and fall off. Below is a video demonstrating how the to remove skin tags, with the TagBand device. If you’d like more information about the TagBand device, check it, and it’s 100s of reviews on Amazon. Below, you will find a number of skin tag removal home remedies. Some appear a little odd at first, but all the home remedies listed are said to be effective at getting rid of skin tags. By far and away, the most popular home remedy for skin tags, is apple cider vinegar. ACV has shown to be safe and effective, over and over. With this in mind, the apple cider vinegar remedy is the one I would start with. This is why it is first in the list, and why we have created an apple cider vinegar skin tag removal infographic. Apple cider vinegar is probably one of the best known home remedies for removing skin tags at home. How to remove skin tags with apple cider vinegar – despite the intensity of its smell often putting many people off, this home remedy is renowned for removing the skin tag completely. It’s also a home remedy that most of us will find lurking in the bottom of our store cupboard! Apple cider vinegar is both highly effective and responsive to the removal of skin tags but, before you use this skin tag solution, it’s important to note that apple cider vinegar can sometimes cause very mild itching or stinging. This is nothing to worry about though, and kind of shows that it is doing its job! It’s worthwhile diluting the vinegar with water before applying it to your skin tag – this will minimize any discomfort or stinging. First of all, before using apple cider vinegar (ACV), it’s important that you thoroughly cleanse and dry your skin in and around the skin tag. Now, soak a cotton ball in the apple cider vinegar. Squeeze off any excess ACV. Start to gently apply the apple cider vinegar to the skin tag. Try to insure the whole skin tag is coated with ACV, whilst trying to minimize contact with the surrounding area, then leave to dry naturally. Follow this procedure and apply the apple cider vinegar up three times a day. After a few days, the skin tag should begin to turn brown and dry out. Over the coming days, the skin tag will continue to darken and dry out. Usually, within 7-10 days, the skin tag will have turned black and completely dried out. When ready, the skin tag will now simply fall off. Tea Tree Oil is commonly used to treat and prevent a host of skin problems, including blemishes, spots and skin tags. Oh, and it’s most likely that you will find a bottle nestled deep in the bottom of your bathroom cupboard! It’s also known as the most painless way to remove skin tags from your body. This is because the oil contains a wealth of anti-bacterial, anti-fungal, and antiviral properties that actively join forces to dry out your skin, causing your skin tag to fall off on its own. 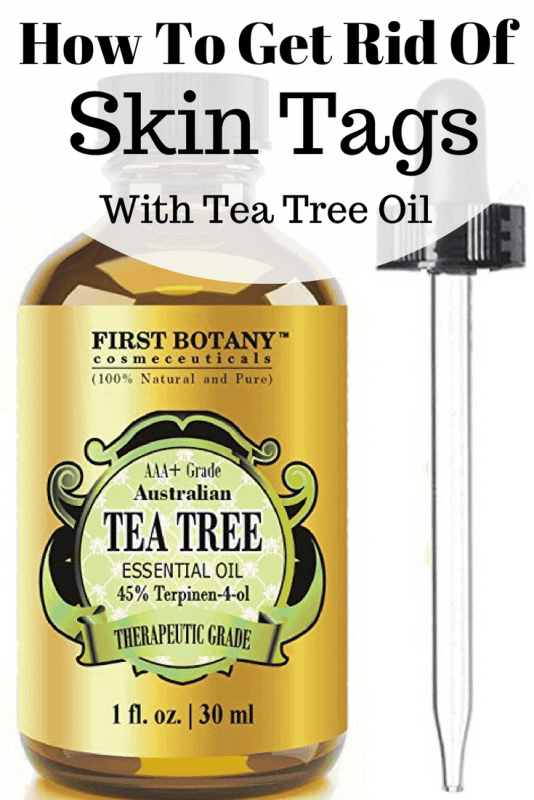 Find out how to remove skin tags at home with tea tree oil below. Start by taking a clean cotton ball and soak it in warm or cold water. Before you apply the oil, make sure that you clean your skin tag thoroughly in order to remove any access dirt or oil (your skin tag must also be clean to achieve the most effective results!). Now take your cotton ball and gently massage the skin tag, as well as the surrounding area, being careful not to apply too much pressure. The results are not instant but, in time, the skin tag will fall off of its own accord. For the best results, repeat this process up to 3 times a day. Lemon juice is not only super tasty and good for you, it’s also a powerful antiseptic, making it one of the best home remedies for removing skin tags from the body. This is because it also contains citric acids, which actively seek to dry out skin tags by decomposing their cells – who knew? Simply cut a fresh lemon in half and carefully apply its juice to a cotton ball. Now, apply this directly to the skin tag and surrounding areas. For best results, do not wash it off. Yes, dandelions are much more than those never-ending, annoying weeds that populate your back yard! In fact, dandelion stem juice is used around the world to help with a host of skin issues including the removal of skin tags! And it’s so easy to start making the most of this effective skin tag home remedy at home. First of all, you will need to get your hands dirty and collect a handful of dandelions from your back yard, ensuring that they are still attached to their stems. This is important as the stem is where you will need to extract the juice from and is integral to the process. Simply squeeze the stems tightly and this should remove all of the juice you need. You will see that a milky liquid will come out of the stem, this is the liquid that you will then apply to your skin. Now you need to cover your skin tag and the surrounding area with the liquid. Once you have done this, take a band-aid and cover it to ensure that it remains in place. The dandelion stem juice works by drying out your skin tag, causing it to eventually fall off. This is a proven method that has worked on thousands of people around the world however, it’s not suitable for everyone. If you are allergic to marigolds, daisies, ragweed or other similar plants, you will also most definitely be allergic to dandelions so avoid this natural remedy! Applying oregano oil is another great way of removing skin tags at home, quickly and painlessly. Using Oregano Oil regularly can result in skin tag removal in as little as 4 weeks and, providing you apply the oil to your skin tag up to three times a day, it will eventually drop off of its own accord. This is because the oil contains three types of phenolic terpenoids components (thymol, arvacrol and p-cymene). All three of these components contain powerful antibacterial properties that actively work together to remove the skin tag. Alongside these powerful components and properties, oregano oil also contains antispasmodic, antimelanomic, anti-inflammatory, antiseptic properties and anti-oxidatives. Start by creating a mixture of 4 to 6 drops of coconut oil and 2 to 3 drops of oregano oil. Next, apply this formula to your skin tag and the surrounding areas up to 3 times a day to achieve the most effective and long lasting results. 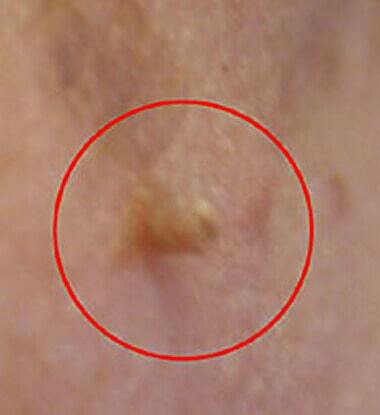 The system will eventually dry out your skin tag and cause it to drop off your skin. If you have a skin tag near to your eyes this is not a remedy you should use as it can causes redness or skin irritation. It is also important to always dilute oregano oil with another oil. Despite being deliciously stinky, garlic is also great for removing skin tags yourself (if you can stand the smell of course!). This is because fresh garlic contains a whole host of anti-fungal and antibacterial properties that work together to help improve a variety of skin issues. Fresh garlic works by drying out your skin tag, causing it to eventually drop off. And, it’s easy to use. All you need is three or four fresh garlic cloves that should be ground into a paste. Then simply apply the paste directly to your skin and place a band-aid over it to keep it secure. Fig stem juice is well known for it’s connection to assisting with a whole host of skin related issuing, including skin tag removal, due to its ability to help balance the alkaline-acid balance. Simply pick up some fresh fig stems and blend them together in order to extract the juice. Once the juice has been blended together, apply it to the affected areas up to four times a day. The majority of people notice a difference within four weeks however, results indicate that cases vary from person to person, so don’t be disheartened if you do not see the results you want within this period of time! We all know the effect it has on our eyes when we are cooking but did you know that it is also a proven method of helping to remove skin tags? So, how to use onion juice for skin tag removal at home? Well, simply cut an onion up into small segments and leave it in a vessel overnight, ensuring that the vessel also contains some salt. Make sure that you leave it for at least 7 hours, then extract the juice from the onion when you wake up. Now, simply apply the juice to the skin tag for at least 10 -12 days. This should then remove the skin tag completely! Now this is a skin tag remover that almost all of us will have in our bathroom cupboard or beauty box. Nail polish works by drying out the skin tag, which then results in it dropping off completely. Like the majority of home removal solutions mentioned, this is not a one off skin tag removal solution. It’s important that you apply the nail polish up to three times a day until you the skin tag fades away. How to remove skin tags with bananas! Bananas are not only super nutritious and healthy, their peels are also perfect for helping with skin tag removal from all parts of the body. Start by cutting off a small piece of banana peel. Next, place the inside part of the banana over your skin tag, ensuring that it is completely covered! Now cover it with gauze and keep it on overnight. If you repeat this on a daily basis, the skin tag should naturally fall off! Using potato as a natural solution to remove skin tags at home is another tried and tested solution that has proven to be extremely successful. It’s super easy to do too, but best done at night when you are not out and about! Simply take one piece of potato, place it over your skin, and secure it in place with a band aid. Continue to do this for a few days, and you should start to notice a difference. What Is A Skin Tag (Acrochordon) Anyway? A skin tag, also know as an acrochordon, and sometimes refereed to as fibroepithelial polyps, is a type of benign skin growth. In non-technical terms, they are basically soft skin growths that look like a small piece of skin, which can often be found hanging from your body. Although some are barely noticeable, others can occur in sensitive areas such as on the eyelids, groin folds, armpits and under the breasts. And there’s no limit to how many skin tags (acrochordons) can appear on your body at any one time. In fact, it’s possible for an individual to have up to 100 skin tags present on their skin in a lifetime, so you can see how they can become an annoyance! There isn’t one trigger associated with skin tags (remember medically known as acrochordons), although obese adults are more prone as experts have regularly identified a corresponding link between the two. Chaffing and skin rubbing together is also thought to be a trigger This said, it’s predicted that each and every one of us will develop a skin tag at some point in our lives. Luckily, there are a host of skin tag removal treatments available, many of which you can do yourself, at home. We’ve compiled a list of helpful skin tag removal treatments and home remedies that should help you to remove your skin tags. Just to note – we don’t recommend just cutting off skin tags. Cutting off skin tags can lead to injury and infection. So there you go! With the TagBand device, plus a host of natural ways to remove skin tags at home options, hopefully you’ll find a solution that works for you.